What is the OhmConnect Buddy Program? Pair up with a friend, view each other's #Ohmhour performances, and earn extra points and tokens if you both reduce below your forecasts. 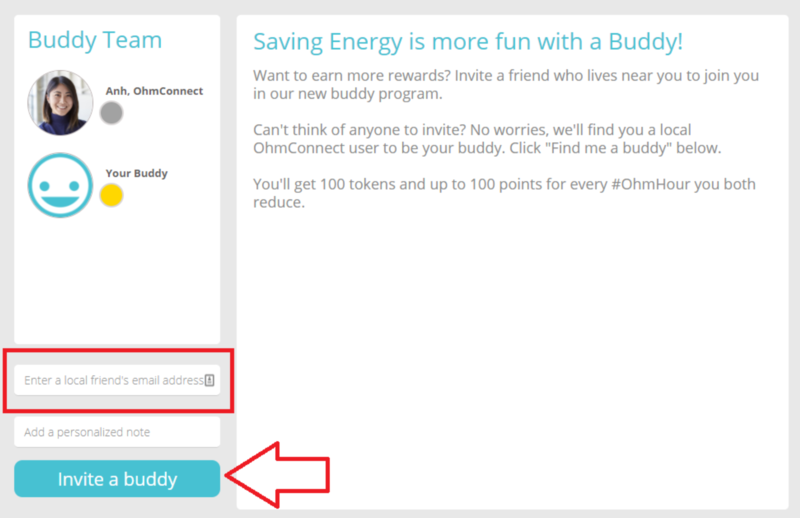 OhmConnect Buddy is a program that lets you pair up with a friend, view each other's #Ohmhour performances, and earn extra points and tokens if you both reduce below your forecasts. You can also chat with one another and see an activity stream of the cool things your buddy is doing: connecting their devices, leveling up, and even what they are pledging to do during an #Ohmhour! 0 --> 100 points, based on your combined average reduction. For example, if you save 30% and your buddy saves 40%, you will get 35 points. Can my buddy's performance affect me negatively? Nothing your buddy does can ever affect you negatively. You won't ever lose points or your streak for anything your buddy does. You can only earn bonuses through the buddy program, and it can only provide benefits, but never drawbacks. What types of Buddy #Ohmhours are there? Unsuccessful #Ohmhour: Being successful requires that both buddies participate and reduce below their own, personalized forecast. If either buddy doesn't participate and/or doesn't reduce below their forecast, you won't qualify for a successful #Ohmhour. This will be indicated by the red icon shown on the Buddy page. Pending #Ohmhours: Pending #Ohmhours are shown on your Buddy page by a light green icon. A pending #Ohmhour means that either OhmConnect has not received data for either you or your buddy, or you or your buddy have dropped below Silver. Upcoming #Ohmhours: Upcoming #Ohmhours are shown on your Buddy page as a blue icon. Be sure to message your buddy and commit to saving! Successful #Ohmhours: When you and your buddy reduce below your forecasts, you'll receive extra tokens and points. You'll also see your average percent reduction in the hover over on the green icon. Note: If you are in an #Ohmhour but your buddy isn't, that #Ohmhour will only show up on your personal dashboard. Who is eligible to be in the Buddy Program? Finally, due to the local nature of #Ohmhours, buddies have to live in the same area. So go ahead, invite your neighbors or friends in the area to be your buddy! How do I find the Buddy page? How can I get a Buddy? You can invite a buddy with the "Invite a buddy" button. OhmConnect is currently not assigning users to a new buddy. First, find out what their email address is, then go to the buddy page, enter in their email address and click "Invite a buddy." You can invite current #OhmConnect members through the OhmConnect Forum, or friends and family who have not yet joined OhmConnect. Make sure your buddy lives really close to you - the closer to the same zip code, the better! Help spread the word about saving energy to new folks! How can I see and verify how many points I'm earning for the Buddy OhmHours I'm participating in? You can see your points for the Buddy program in your downloadable points history, found on your dashboard in the "OhmHour Performance" section. Look for "Rewards For Buddy Demand Response". Points are distributed the day after both buddies have their points calculated, so if you and your Buddy saved, be sure to check out your points history. Buddy points will be calculated when both parties have received their data. Every OhmHour has buddy points calculated just as long as you and buddy have an OhmHour on the same day - same hour is not required. How can I see and verify that I am receiving the 100 tokens for each Buddy OhmHour? This can be found in your Token history. Look for "Bonus for both members saving successfully". Want to leave your buddy? We're sorry to see that... but we built something to help. Click the "Leave my buddy" link on the buddy page and you'll leave your buddy.